TARPON SPRINGS, FLORIDA. We arrived on Sunday, January 26, in the early evening and experienced the miracle of travel by jet that often taken for granted: wake up at home and go to bed 3,300 miles away on the same day. 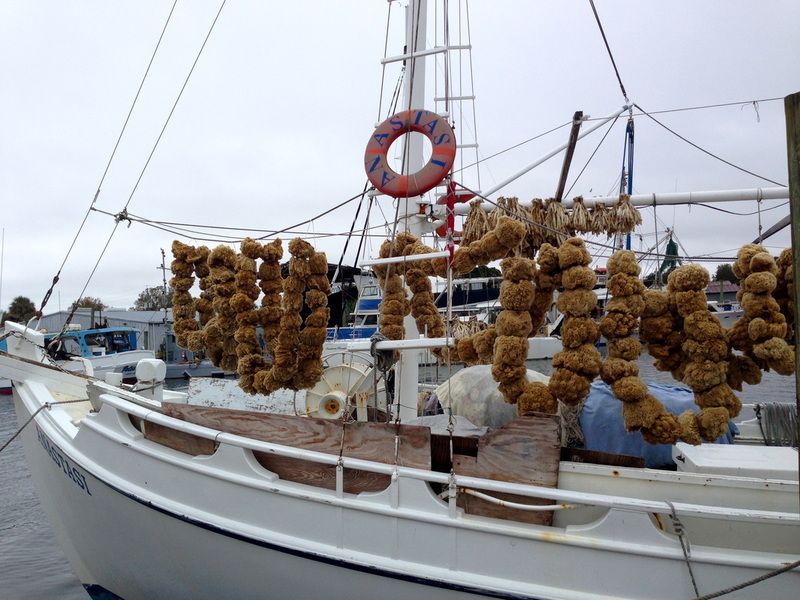 Tarpon Springs is about 30 minutes northwest of Tampa and is one of the safe harbors used by Loopers. Monday, January 27. 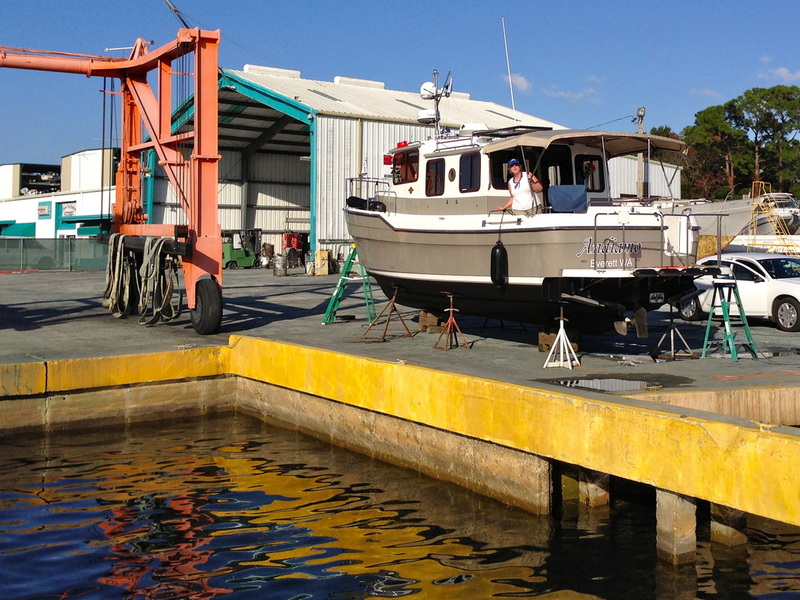 Our first stop was George’s Boat Yard in Tarpon Springs to meet George, look over the yard, explore the short-term stay opportunities and to tell George that Andiamo would likely arrive late afternoon on Tuesday. 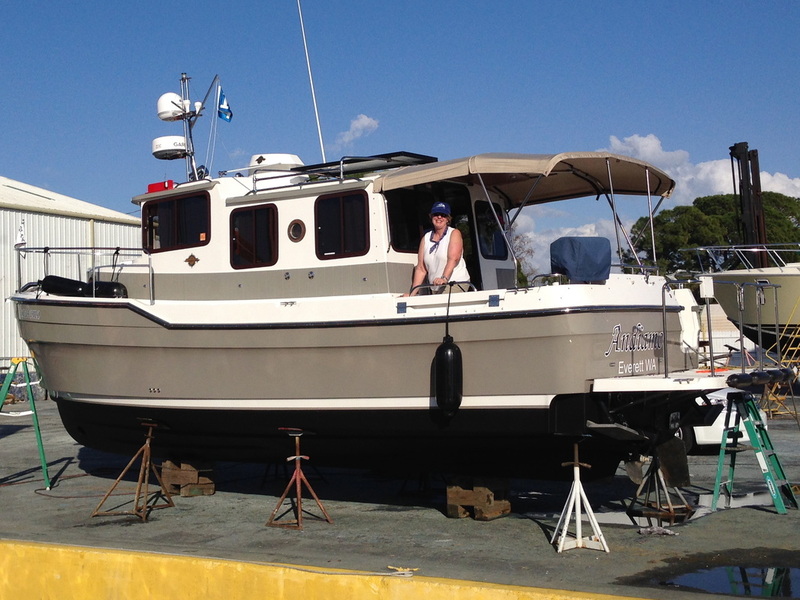 We picked out the bottom paint to use, Petite 75, and walked over to the Port of Tarpon Springs office and learned that they could likely find a place for us for the weekend. Price: $2 per foot with electricity. Their docks are fixed, meaning they are on piles and tieing the boat to the piles is tactic to be mastered and the water is shallow - 5 feet. AGLCA and some friends had recommended the Turtle Cove Marina, near downtown Tarpon Springs. 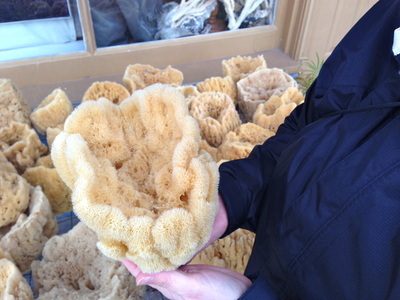 We went in search of this and drove through the quaint downtown, the sponge docks, past the evidence of the thriving Greek influence and found Turtle Cove Marina. Mid-afternoon and we drove south to the nice small town of Dunedin that is about 20 miles south of Tarpon Springs to meet up with Rich and Cheryl and their Ranger 25 “Roam.” We enjoyed their company and Rich showed us locations to anchor and moor and tips to know. We took them in our car to the liquor store and to the Publix Market to stock up and helped with their bags back to their boat. We walked the scenic Main Street to a BBQ place and enjoyed the evening of stories and laughter. Rich’s beer order was PBR and mine was Kona Brown from the Kona Brewing Company. I did not know what PBR was until the can of Pabst Blue Ribbon was delivered. Tuesday, January 28. Cory, who is bringing Andiamo to us, sent a text that he is slowed down by snow and ice from a huge storm that has affected most of the south and he is driving through Georgia in the snow. There was no snow in the cascades or the rockies. Cory is surprised that the snow is an issue in the south. His ETA was either late Monday or early Tuesday and is now later this evening with an early Wednesday off-load. We headed to George’s to share the news and to continue building our relationship. We spent the day exploring points north of Tarpon Springs, heading toward Crystal River up Highway 19. A quick search of the web found an interesting stop in Homosassa at a state park known for seeing Manatees. An hour’s drive found a huge parking lot that was packed with cars. We paid the $10 each entry fee, boarded a small pontoon boat and saw our first alligator in the fresh water creek with a pack of turtles. We spent most of the day there and thoroughly enjoyed it. The park was a former privately owned wildlife theme park and tourist attraction that was bought by the county in 1984 and sold to the State of Florida several years later. 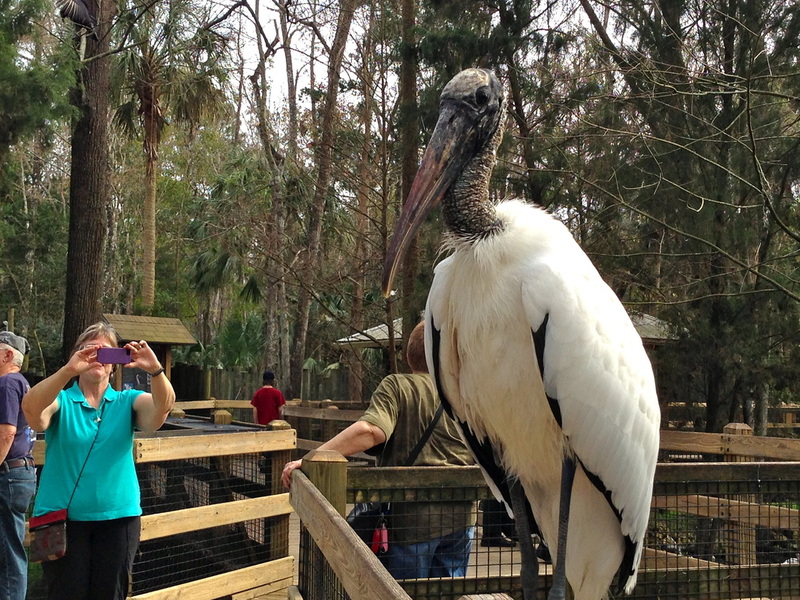 The park that housed exotic animals, was the site of some Disney movies and TV shows, was transformed into a native wildlife sanctuary and sort-of zoo. 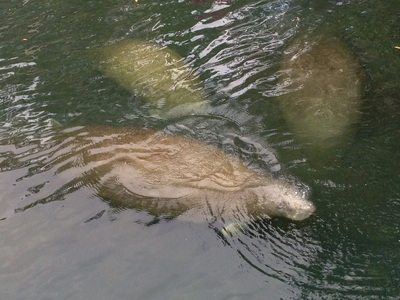 Our first manatees were mistakenly identified as large boulders. 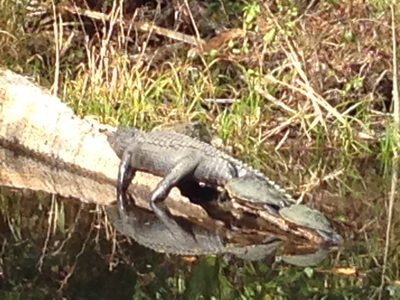 Then, we saw them in the river, outside the boundaries of the park. They are truly gentle giants who appear to be very vulnerable. At 1PM, Cory sent a text that he has seen seven roll over accidents on snow covered roads in Georgia and their speed was about 20 miles per hour. At 3PM, Cory texts that they are at a stand still for the past two hours and will be probably arrive on Wednesday. The drive on Highway 19 through towns and rural areas created some observations and impressions. The number of hospitals, clinics, plastic surgery, funeral homes, the elderly being everywhere and billboards advertising lawyers confirmed that this is death’s waiting room. The sameness of the malls, the same corporate stores with their branding of logos and country-wide architecture creates a cultural wasteland. The evidence of the Great Recession is plain to see: vacant strip malls, empty parking lots, and many, many foreclosed homes. The positive impressions: people are nicer and more polite and gracious. 6:30PM and Cory sent a photo from his windshield of a sea of taillights with the text that Atlanta is a parking lot, they have gone 1 mile in two hours and are calling it a night. A solid week of sub-freezing temperatures and horrible traffic conditions made the worst possible conditions for Andiamo’s transport. Hopefully, the shrink-wrap has held up and protected the gelcoat and windows from the winter grit. Though the water systems have anti-freeze in them, I worry about the other stuff. What about all those relays, switches, computer chips, and micro-parts and how will they fair in the combination of brittle cold and vibration from the road trip? I chose to roll with it and take it as it comes, hoping for the best and mentally preparing for the worst. Wednesday, January 29. A storm front is blowing through with wind and rain. Cory sent a text that he is 350 miles away. Andiamo should arrive late today and the work to ready her for the cruise will begin. We spent the day enjoying Tarpon Springs and its rich history that was dominated by the discovery of sponges in the early part of the 20th Century. Greeks came to Tarpon Springs by the thousands to dive, rake, and snag the sponges. 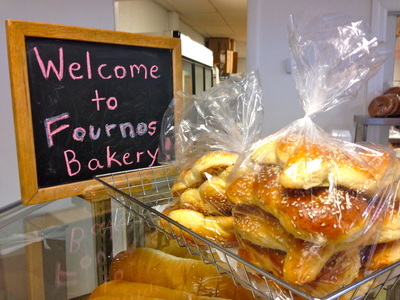 Today, the city has one of the largest concentration of Greeks in America. Many of the places we visited, Greek was was the language. Another example of serendipity on this trip: At The Spiceman’s Kitchen, a shop near the sponge docks, we found the Marie Sharps that we came to love in Belize and discovered the owner, Chuck Wilson, was very interested in Ranger Tugs and thought of doing the Great Loop. We exchanged cards and he said he wanted to follow us on our website. We invited him to the tug rendezvous at Palm Island Marina. George does not mark his business on the street with a sign, so we waited at the driveway for Cory and at 4 PM he came around the corner with Andiamo still fully enclosed in the shrink-wrap. As the trailer was backed down the long driveway, there were several small holes that Hunter, Cory’s son and co-driver, said came from the tree at the Home Depot where they spent the night. There was a small rip on the port side and Cory said a trucker’s mirror caused that and ripped off the mirror. Though we would know more in the morning, the tug looked really good. Cory reported that the driving was great until they reached Georgia and he had never seen anything like it. He saw a vehicle roll over and crash into a guardrail that may have killed the driver. He got out earlier than most drivers because he took a side road off of the freeway, used his four-wheel drive and later had to put chains on his front tires. We started putting the boat back together. Drawers had opened but had not spilled. Jolts had knocked down the thermometer that was stuck to the wall with stout Velcro. We immediately found evidence of significant freezing temperatures inside the cabin. Cans of coke had exploded and a jar of pickles was still frozen. But there was no dramatic damage. Turning on the house batteries revealed the first issue, the pump in the shower sump was running continuously. Putting water down it did not change anything so the float switch was apparently stuck. Only turning off the house batteries stopped the pump. 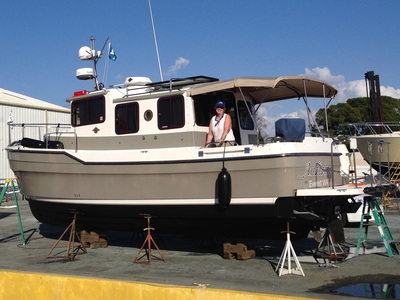 A conversation with Kenny at the factory revealed that the sump pump was located under the master berth, under a panel and mounted deep in the bilge. Meanwhile, when the fresh water pump was turned on, the system never pressurized, a sign that there was the substantial leak somewhere and RV coolant-colored water was found in the bilge. Tackling the shower pump (the photo above) was the first order of business so the house battery system could be left on. The factory placed the unit in an easy to access location though it was in the bottom of bilge and required standing on your head. After the lid to the sump box was removed, the big surprise was finding chunks of ice. Though RV anti-freeze had been added it, plainly there was not enough. Despite using a hair dryer, the float switch could not be fixed while it was in place. Removing the float switch revealed that it was frozen into a block of ice. This was surprising because the tug had been out of freezing temperatures for 24 hours. Once the ice was removed from the float switch, the sump pump operated properly and thankfully, there was no other damage to this system. I wondered what other damage would be found. We needed some stainless screws to re-attach the frame that supports the canvas over the cockpit. Also, and when the yard's 30-amp receptacle box was inspected because there was no power, I found that these were disconnected and a trip to West Marine was in order to get an adapter to use the 15 amp plugs that still worked. Next came the leak in the fresh water system. Opening the engine compartment found water sprayed throughout the compartment and pink water in the bilge. Thinking that condensation from the boat being shrink-wrapped caused the water on the surfaces, all of those were wiped dry. Running the system for a moment showed water coming through the weep holes on the port side under the mid-cabin berth. A conversation with Ronnie at the tug factory revealed that the most likely culprit for the water leak was the hot and cold mixing valve that was behind the shower. Accessing that required opening the access panel in the mid-cabin berth. Kayaks, bikes and gear were moved, panels opened but no evidence of a leak was found. Sometimes it is best to just stop, be silent and think. The hot water heater had been a source of most of my water leak issues on the Laurie Ann. Opening the engine hatch again, showed the compartment was wet again. A quick cycle of the water pump identified the culprit as a broken flex hose that connects the colder water side to the hot side to make a mixing chamber. Though jolts and vibration could have weakened it, I suspected cause was freezing, despite cycling RV solution through it. With the yard closing in 30 minutes, things were put away and lists were made to get the parts to put Andiamo back together. From the outside, the tower was up, fenders were out, the anchor was out and the cockpit frame was up. Inside, Laurie had gotten everything back up on the shelves, the food was inventoried and organized and the head was cleaned out, inventoried and organized. Laurie woke up to the hard rain and another day of a wrong weather forecast. The science of weather forecasting is on the same par as designing water run-off from the streets: nice intentions but poor execution. We arrived at the boatyard at about 8AM and between rain cells the cockpit canvas is mounted on it’s framing and stretched tight to provide protection from the rain. Laurie started removing the tape residue from the shrink-wrap with 3M Adhesive Remover. Meanwhile, the replacement flex hose was installed on the water heater. One of the sweetest sounds of the day was the water pump pressurizing the system and stopping; revealing there are no other leaks. High-fives among the crew! The flushing of the water system would take most the day and while other tasks were done because the boat's two water pumps are the only way to remove water. The RV anti-freeze had to be completely removed by multiple flushes. Then. a full tank of fresh water with 3 tablespoons of bleach were added and flushed and finally the 70 gallon water tank was filled. The water tasted great. All the systems were checked; the electronics, television, iPod, the head, satellite radio, propane and the interior and exterior lighting. All were good. The surprise was the electronic chart on the Garmin did not have the detail that was I used to in Puget Sound. It was adequate but not superior. 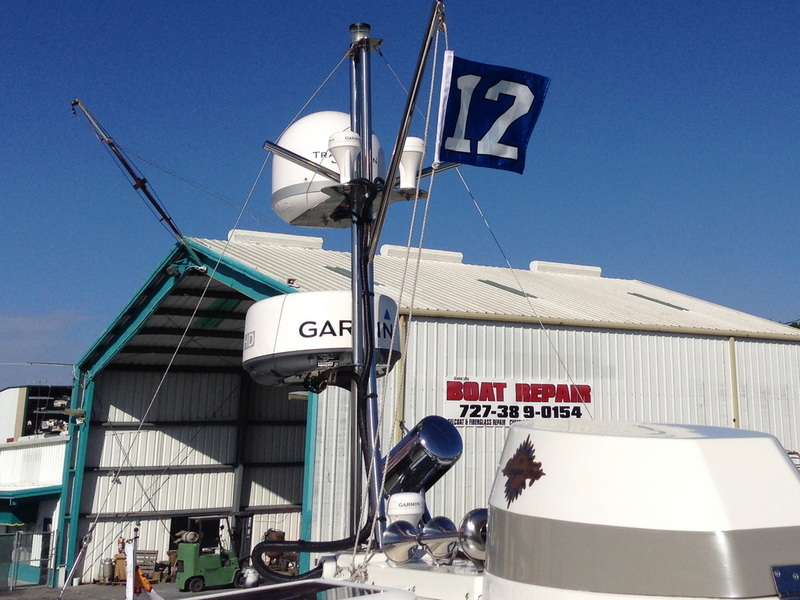 Another trip to West Marine and some research showed that I was using a supplemental G2 Vision chip for Puget Sound. These chips are available for our route but they are cost several hundred dollars each and cover only a part of a region; a business decision and a marketing ploy by Garmin. All this time, I was using the heroin of cartography and now I would settle for the equivalent of mass produced beer. The next sweetest sound of the day was Laurie starting the engine while I fed a hose into the sea strainer. It jumped to life and kicked out water from the exhaust as fast it would take it. All was well with the impeller and block had not cracked in the cold. But a baseball sized block of ice came out of the exhaust. Rain was steady all morning and George was confident that he would be finished with us on Saturday but he was not making any money today. 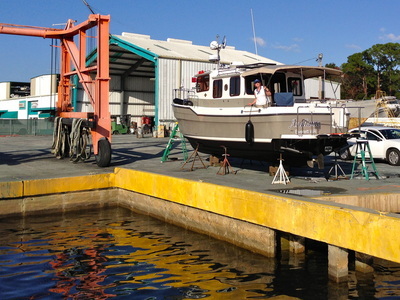 After reading the research and the technical bulletins on the bottom paint that was chosen, the bronze rudder, the propeller and the trim tabs would not be painted which was common for all the boats in the yard. 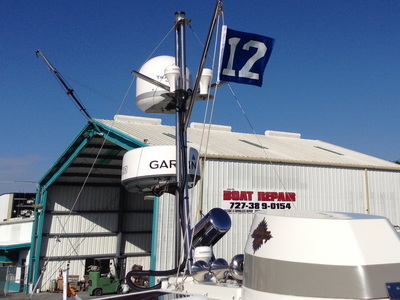 The Seahawks' 12th man flag was ceremonially raised on the tower and after a five-year hiatus, the AGLCA burgee was placed on the bow rail, a real symbol that the trip was about to start. After lunch at Costa’s Greek Restaurant and getting some treats for later at Fournos Greek Bakery, Laurie did a major provisioning from the Publix Market and at the end of the day we loaded the food and Andiamo was ready for cruising. We finally caught a break with the weather and what was forecasted, actually happened. The morning fog burned off to clear, bright and actually hot days. When the temperature reached the mid-80’s, Laurie employed the strategy for cooling: out came the fans and the neck cooler. This was the first time the sunscreen was used. For these two days, Andiamo’s exterior was cleaned, buffed and waxed. George and his crew worked a long day on Saturday, way past their normal closing time of noon and finished the bottom paint. The tug as sanded by 10AM and the first coat was done within 2 hours. The second coat went right on after that. The hot weather, probably the warmest in North America, made it all possible. George said that he would have the boat finished by Saturday for a Monday morning launch appointment. We started on the top of the boat and created a rhythm and sequence: I used the liquid rubbing compound to remove the oxidation and buffed it. Laurie applied the liquid marine polish and buffed that. After the top, Laurie did all the stainless from start to finish with Prism Polish and did all the windows that were finished with a coating of Rainex. After finishing the bow, the hull was done and then the sides of the cabin. The cockpit will be done when Andiamo has left the boat yard because of the dirt and grit that is tracked in. 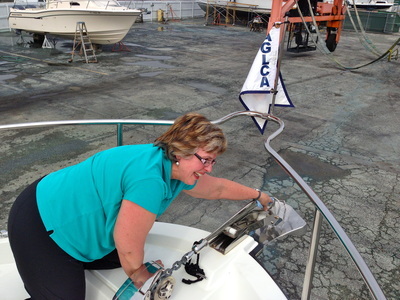 Though the yard was closed on Sunday, we decided that Laurie was the one to approach the marina crew to ask for the gate to be unlocked. This weekend was the first real attempt to clean, buff and wax the boat since we owned it. It was hard work, yet rewarding, and it has a way of clearing the mind of the distractions and worries that can make life more complicated. We had two meals at the marina’s café and enjoyed the good food and the dockside seating. While adding a reminder to put a second coat of wax 30 days from now, we commented on few reminders we have now. 6 weeks ago, there were about 15 reminders of things to do in the coming days. 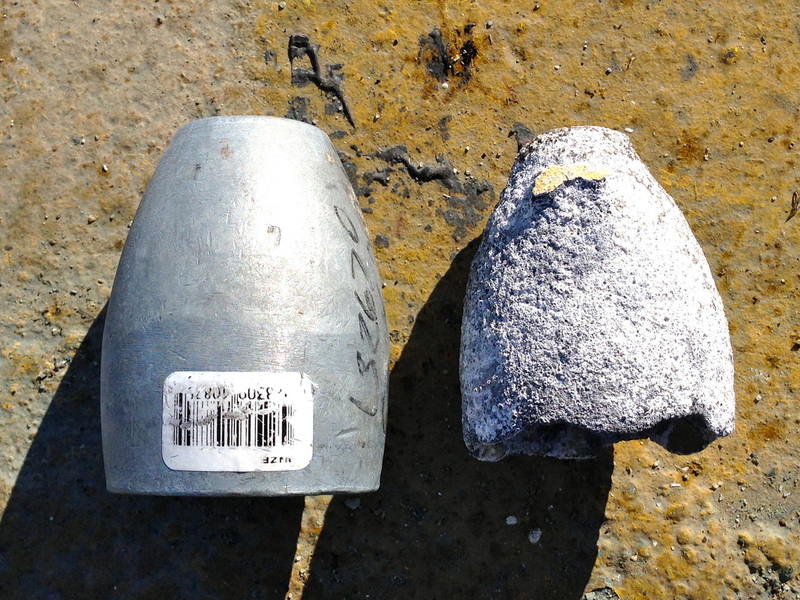 The old anodes were taken off. 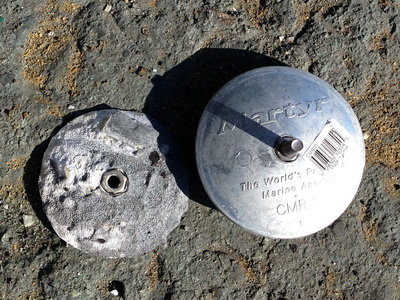 The prop anode was particularly bad with only 6 months of use. We had been going to the local West Marine store at least once a day and when the prop zinc was too small, we found that we have to hunt for the right size and install it before the boat is launched on Monday. Ready for the Monday morning launch.